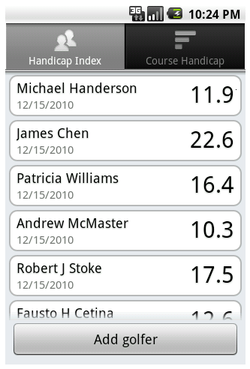 GHIN Tracker shows up-to-date golf handicap index for you and your friends. 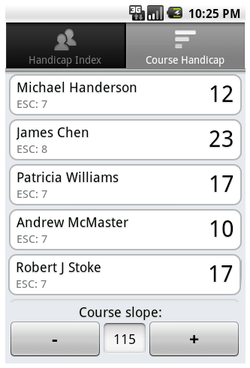 Enter GHIN numbers once and the app will show current official USGA handicaps every time you run it. It can also compute course handicaps and ESC for all players and shows them all in one place. * Look up golfers by GHIN number. * Shows name, club and effective date. * Supports up to 8 golfers. * Always shows current up-to-date official handicap. * Easily compute course handicap for all players in one place. * Includes Equitable Stroke Control (ESC) - the maximum number of shots a golfer can report on each hole for handicap purposes. Download now on Android Market. We'd love to hear from you. Please use feedback form.